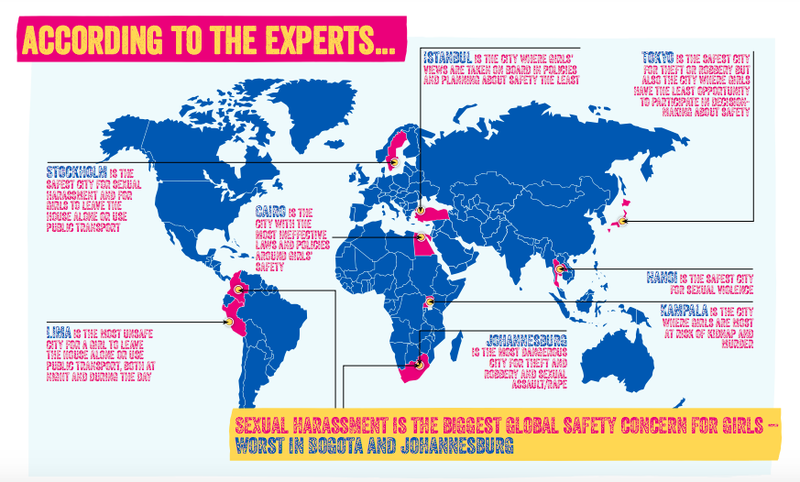 According to research conducted by the international NGO Plan International, Johannesburg and Bogota are among the most dangerous cities in the world for young women. Stockholm and Sweden are among the safest cities in the world; Lima is considered the most safe city in the world to use public transportation or leave the house. The report, called, “Girls' Safety in Cities across the World,” was released earlier this month. "This survey is the first of its kind to examine the safety risks facing girls and young women on such a large scale, highlighting the universality of the dangers girls face in cities across different societies and cultures," is how the report describes itself. Among other findings the report says that Hanoi is the safest city for sexual harassment and Kampala Uganda is the city where girl are most likely at risk for kidnap and murder. Sexual harassment, the report notes, is the biggest risk facing young girls. The plan surveyed almost 400 experts across six continents and 22 cities. Halloween 2018 broke the box office this weekend with the tenth biggest opening for an R-rated film ever with over $75 million in its first weekend outing. “Once the defining visage of victimhood in the horror subgenre of slashers, Jamie Lee Curtis’ Laurie is this film’s actual omnipotent being, appearing as if out of thin air to whisper in his ear, ‘Happy Halloween, Michael.’ She then delivers the next of many strikes toward what should rightly be Michael Myers’ final resting place,” writes Den of Geek. This was a celebrated feminist weekend with Jamie Lee Curtis boasting on Twitter: “OK. I’m going for one BOAST post. Biggest horror movie opening with a female lead. Biggest movie opening with a female lead over 55. Second biggest October movie opening ever. Biggest Halloween opening ever #WomenGetThingsDone @HalloweenMovie.” Hum… can women led films’ success be any longer questioned? Ride sharing app drivers are in for a reckoning in Indonesia. According to the Indonesian National Commission on Violence Against Women, there were 348,446 sexual assaults reported against women last year, a 74 per cent jump from the year previous.” Anecdotes about flirty ride-hailing drivers have become all too common in Indonesia following the 2015 ride-sharing boom, when homegrown ride-hailing firm Go-jek launched its mobile application, followed by Singapore-based Grab," writes Resty Woro Yuniar. "Drivers’ impropriety became a growing concern as their behaviour inevitably progressed into sexual harassment, assault, and even murder." Indonesia has real problems with domestic violence, the most prevalent form of violence against women in the country. India is in the thick of their own #MeToo moment, as is most of Asia. Bollywood leading men, magazine editor Tarun Tejpal, climate scientist RK Pachauri, as well as MJ Akbar, who resigned as minister of state of external affairs last week after more than a dozen accusations of sexual harassment are among the major cultural figures caught up in accusations. "But that is what makes this a seminal moment in India," writes Amy Kuzmin of the Financial Times. "Until now, young women at the start of their careers have hesitated to take on those with power, fearing that they, rather than their tormentors, would come under greater scrutiny and pay a higher price. That silence has remained prevalent, despite a 2013 law requiring employers to establish internal complaints committees, where grievances over sexual harassment can be lodged and heard." NPR also just released audio of an interview with a Bollywood actress, whose accusation made 10 years ago wasn’t well-received then and is now finding support through the #MeToo wave. The South China Morning Post, which has been doing an amazing job chronicling the #MeToo movement through Asia, reports on University officials being fired as a result of sexual harassment accusations. Jilin Agricultural Science and Technology University fired computer science lecturer Wang Donglai for breaking protocol with university ethics. A student has accused Donglai of sexual harassment. "This is the latest in a wave of sexual harassment allegations to sweep across China as part of the global #MeToo movement, which authorities have been unable to suppress entirely. Allegations have come thick and fast, in particular, against academics at Peking University, Guangzhou’s Sun Yat-sen University, Renmin University and Beihang University in the past year," writes Laurie Chen. Further, Chinese-Thai anthropologist Non Arkaraprasertkul’s career was put on hold while National Taiwan University, his previous employer, examined claims of sexual harassment from several students. Spiegel Online ran an interesting story about the experiences of three women former cabinet officials in the German government: Rita Sussmuth, 81, a former family minister for the Christian Democratic Union from 1985 to 1988 under Chancellor Helmut Kohl, as well as Heidemarie Wieczorek-Zeul, 75, of the Social Democratic Party, a development minister under both Schoder and Merkel, and lastly Sabine Leutheusser-Schnarrenberger of the Free Democrats. How were you treated when in office, they asked? “Like a woman and not like a person. Back then, when women spoke in the Bundestag (Germany's federal parliament), everyone thought: ‘Oh well, it'll be over soon.’ There were complaints about high-pitched voices and about external appearances. I also experienced disregard of my competence. I was denigrated in discussions on issues for which I was responsible. Instead, men were allowed to speak and negotiate. It was extremely offensive,” answers Sussmuth.